We recently wrapped up our Free Membership Growth Online Summit 2017, where five leading experts shared strategies for increasing membership growth. Whether you registered for the Summit or not, you can find all the webinar recordings here. Plus, if you want to learn how to apply some of the strategies using Wild Apricot, please join us on December 6 for a special webinar with our resident tech expert, Terry, and coach Rano. Even if you didn’t attend the Summit webinars, you’ll learn ways to use Wild Apricot to help you grow. If you’re a Wild Apricot customer, this is a great opportunity to learn how to make better use of Wild Apricot. If you’re not a customer, this is a chance to see what’s possible using Wild Apricot. Sign up now and we'll see you on December 6, at 2:00 PM (ET) / 11:00 AM (PT). 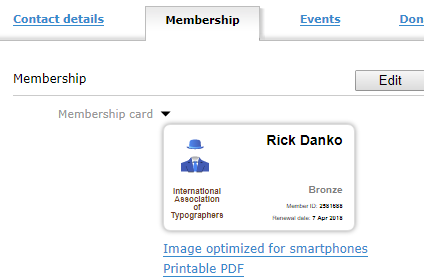 Administrators can now print membership cards, but only one at a time from the Membership tab of each member's contact record. Each card can be downloaded as an image optimized for display on smartphones, or as a printable PDF. If an image hasn't been uploaded to a member's contact record, a placeholder image will be displayed in its place (see below). 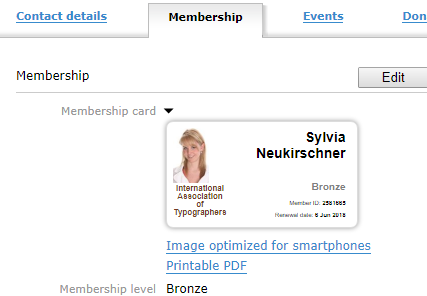 For more information on membership cards, see this help page. We are excited to announce the launch of the “Restricted access for folders” feature. It is currently available for use and we are closing the wishlist thread. You now have the ability to set permissions on folders. All files and subfolders inside are automatically assigned the new access level. When a new file is uploaded into this folder or sub-folder, it is automatically assigned the same level of access. Within the restricted folder, the administrator is still able to change the access level for individual files and subfolders. The new functionality is also available in the Insert resource dialog. For more information, here is the link to the help page and here is the link to the Wishlist thread. If you have an event where people are waiting in a waitlist, this applies to you. Once space becomes available for a waitlisted event or registration type, public registration for the event or registration type will be automatically closed. This allows those on the waitlist to be registered for the event and prevents anyone else from snapping up the newly available spaces. An administrator can manually register the contact by clicking the Register now button from the contact's waitlist registration record. As with all manual event registrations, it is the responsibility of the administrator to send a manual confirmation message. An administrator can manually email the contact and invite them to visit the event details page and click the Register button to register for the event. The email to the contact on the waitlist can include the event URL – which appears on the event details tab within the event setup screen – so that the contact can jump right to the event details on the public site. For more information on how event waitlists work, see our help page. Sign up now and we'll see you on December 19, at 2:00 PM (ET) / 11:00 AM (PT).